This is the Historic Blake House, built in 1847. The Rose Room is located in the back of this building. The Rose Room of the Historic Blake House has been a favorite of guests for well over a century. This is the sign you'll see when you arrive. One of the many updates is the addition of the gas logs you see here. The queen bed is comfy, and you will love the antique headboard! The bed is beside the extra large entry door. Here you can see the bathroom entry beside the fireplace and TV. The shower curtain is hung on a curved bar that provides extra space while you shower. In this view you see the left side of the bathroom and the exit to the main room. The Rose Room entrance is on the right, and the back door to the main house is on the left. Here you see the sitting area outside the Rose Room door, looking back toward the parking lot. Front view of the queen bed, looking toward the entry door. The Rose Room feels very warm and inviting. We love the traditional feel of the Rose Room. Here you can get a good feel for the location of the bed, the kitchen nook and the bathroom entry. Here we are outside the front door. We look forward to hosting your visit! PLEASE NOTE: We do not serve breakfast. Located in South Asheville just minutes to downtown, and convenient to attractions like Sierra Nevada, Twelve Bones South and Jake Rusher Park. South Asheville is quickly becoming a "must see" destination in its own right, and we are right in the middle of it. When we first discovered that the historic Blake House was for sale, we thought that living here was just a dream. But our dream has come true and we are excited to be sharing it with guests. Welcome to the Rose Room, located in the main house. It is absolutely delightful with its twelve foot ceilings, its cozy atmosphere and its private entry. It is the perfect couples getaway. We have spent a great deal of time and effort to make it perfect, and we really love the result. We think you will too. We are close to the Biltmore House, the Blue Ridge Parkway, the NC Arboretum, Pisgah National Forest and the Folk Art Center. We are convenient to the airport. The nearby towns of Hendersonville and Brevard are both about a 30 minute drive, making them great destinations for a day trip. Our family lives in the main house, so please be aware that the front porch area is our family space and not accessible to guests. We invite you to enjoy the patio area and to walk around and enjoy the grounds. We hope you enjoy your stay, and we look forward to hosting your visit! You could not find more gracious hosts in Brain and Stephanie! The gracious space of the Rose Room and attention to details is delightful. Love the peaceful setting and wonderful location. We look forward to returning soon. We loved the Rose Room at the Blake House. Enjoyed getting to know the Owners and the wonderful family. Look forward to seeing them again. My best friend and I took a long weekend to escape from work and drove up from Central FL. Everything was easy to find, accessible, welcoming, and comfortable! We were a perfect distance from the bit of hiking we wanted to do, but also from downtown Asheville. The Rose Room itself was amazing. The bed was comfy, the water pressure in the shower was on point, and everything was thought of. Stephanie and Brian were friendly and welcoming hosts. Will DEFINITELY be staying here again. We are so gld you both enjoyed your stay and look forward yo having you back. This is the sweetest little spot to stay. We came up to Arden for just two short days to see the area and visit Asheville. The Rose Room was so comfortable and had everything we needed. Even my husband was comfortable (that is not the norm). Can’t say enough good things! We will be staying here again! We love the Rose Room and are so glad that you and your husband did too. We look forward to hosting you again! A very unique room with amazing high ceilings. The bed was super comfortable. Friendly, helpful hosts. It was a pleasure to host your stay. Thank you for renting. Great Location to visit Asheville. Outside of downtown but very convenient to restaurants such as 12 Bones and Tupelo Honey.... saves you from having to find and pay for parking downtown. The room was quaint and you have space vs most hotel rooms. We were provided everything needed to enjoy our stay. I would recommend for those whom would like to be nearby the Biltmore as well. We visited Sierra Nevada during our stay in which from the location cost between $11-13. Super Happy and Thank You! It sounds like you had a wonderful visit and that the location worked perfectly for your time in Asheville. We enjoyed our stay at the Rose Room and everything was very cleaned. It’s quiet, safe and closed to all the places to dine and shop. We will be back! We look forward to having you stay again. We are glad that you enjoyed your long weekend in Asheville. We hope that you can come stay again. We loved our 3 nights at The Rose Room and will definitely visit again. This is a true "find". It's so quiet and cozy, with wonderful accommodations and we enjoyed coming "home" to The Rose Room after our galivanting each day. The delightful owners live in The Inn and gladly provided the two items we suggested would be an asset. We loved the antique furniture and the Limoges plates on the wall in the very large bathroom. It's close to Biltmore, Hendersonville, Black Mountain and The Blue Ridge Parkway. We look forward to our next visit here. We are glad that you enjoyed your stay and hope that you can come back again. The Rose Room was clean, comfortable and quaint! The gardens adjoining the room were inviting and I took advantage of the small park across the street to get in a short walk. This is close enough to Asheville to be convenient without all the hassle of traffic. I will be back to the Rose Room - I highly recommend it! We look forward to having you back. We are so glad that you enjoyed your stay. The Rose Room was exactly as advertised. It was perfect for a couple of nights away and much nicer than staying in a hotel. The bed was very comfortable. You can make breakfast in the room (coffee maker, toaster, refrigerator). We met the delightful owners who were very friendly and helpful. During our stay we toured the Biltmore Estate, climbed Chimney Rock, visited Sierra Nevada Brewery, hiked the waterfalls at DuPont State Forrest and checked out the NC Arboretum. I would definitely recommend the Rose Room for its comfort and location. It sounds like you visited all the best spots! We are glad that you had a comfortable stay and look forward to having you stay again. The room was very clean and comfortable. There was plenty of parking and accessing the home was easy. The room had an air purifier that worked as a sound machine and we had a great nights sleep. There was plenty of toiletries, towels, a mini fridge and coffee machine. The drive into downtown Asheville was short (about 15 mins) and there was a Fresh Market nearby. Thank you for staying. We are glad that you had a comfortable stay and enjoyed the Rose Room. Thank you for staying at the Rose room. We are so glad you enjoyed your time in Asheville. The Rose room looked exactly like its pictures. Everything was charming and comfortable. The room was clean and the property was nice and quiet. We thoroughly enjoyed our stay. The Rose room really is so charming. We are glad that you enjoyed your stay. My husband Michael and I serendipitously discovered this gorgeous property for the last three nights of our two-week stay in the Asheville area. After completing a 10-day house sit at a rustic location in rural Weaverville, we were looking for something more comfortable and closer to our family. It was our great fortune to find the Rose Room. From the moment we entered, using the convenient key pad, we were thrilled, relieved and relaxed. The immediate ambience is romance and history - but not at the expense of comfort and modern amenities! The bed was comfortable and inviting. The leather chairs in the sitting area were calling my name. There is a jacuzzi tub, and the shower has hot water for days and the perfect pressure (I could barely get my husband out!). No attention has been spared in the details, from the hardwood floors, to the refrigerator and microwave in the â€œkitchen area,â€ - complete with coffee maker, coffee and fixins. My personal favorite was the gas stove â€œfireplace.â€ It was just the perfect antidote to the rainy chilly weather outside. We felt so cozy. We have already planned our next visit! Thank you for the kind review. We are so glad that you enjoyed your stay at the Rose Room. We look forward to having you back. The Rose Room at Blake Inn was FABULOUS! Quiet, cozy...perfect for a time to getaway and refocus; but yet close enough to town and the mountains-if that is what you want. Can't wait to book another stay! We look forward to having you stay again! The Rose Room at The Blake House was everything I wanted it to be and so much more! Right upon walking in, I felt transported to a different time. The furnishings and decor were incredibly tasteful, the bed was comfortable, and everything worked as it should. My Mom and I came to visit The Biltmore, and I feel like the Rose Room could have easily been a part of The Biltmore estate! Definitely stay here if you're in the area - you won't regret it! Th Rose Room is my favorite rental that we manage. It really does feel like you are staying in another time with the high ceilings and elegant details. We are so glad that you enjoyed your stay! Thank you for staying. We are so glad you and your wife enjoyed your time at the Rose Room and we look forward to having you back. My wife and I were in Asheville to visit Biltmore and the NC Arboretum, and this was a good location. The room was very attractive, and well furnished and maintained. We'll definitely return when we have the chance. Thank you for staying. We look forward to having you back. We had a good experience from beginning until we left. It was super easy to find and get into the room, which is very quaint and nice. We liked the way the room was set up with a little fridge, wine glasses, and utensils and other dishwater. When we accidentally left an item in the room, the hosts were incredibly quick to respond to our asking after it and they ensured it was shipped to us. We highly recommend staying at this property! We are so happy that you enjoyed your stay. Thank you for renting! Thank you for staying we appreciate the kind words. The room was very charming and clean. The owners were very nice and made sure that I had everything I needed. Thank you for staying. It was a pleasure to host your stay in Asheville and we hope you can come again. Cute little room. Perfect for a few days in Asheville! My teenage daughter and I stayed here while in town for a horse show at the WNC Agricultural Center. The location was perfect for us, and our room was a cozy safe haven after a long day. Each night, we looked forward to going "home," starting up the gas fireplace and relaxing with hot cocoa in the little living room area. The room was meticulously maintained and very clean. The bathroom was well appointed with plenty of towels, and lots of space to move around. We especially liked the large bath tub/shower. We were in great hands with both the management company and the family who owns the home. We had the pleasure of meeting Stephanie and her daughter, who live in the main home, and they made sure we had everything we needed to be comfortable and happy. We will definitely try to stay here again when we are in Asheville. Thank you for staying. We hope you and your daughter can come stay again. the room was just as described, the hosts were fabulous, the grounds beautiful. be sure to relax in the hammock on the back patio! Thank you for staying in the Rose Room. We hope that you can come again. We came for the Memorial Day weekend, and this was way preferable to staying in a hotel. The drive to anywhere we went in Asheville was no trouble at all, the property was nice and the owners helpful and accommodating without being intrusive. We had a great experience staying in the Rose room of the Blake house! The accommodations were very nice & comfortable, the home owners were very nice and welcoming upon our arrival, and we were close to everything. The Biltmore was about a 10 min drive and downtown Asheville was about 15 minutes away. Thank you for making our stay in your city memorable. The location really is ideal for exploring Asheville and the surrounding areas. We are glad that you enjoyed your stay and hope that you can come again. This large room is perfect for one or two, outfitted with a great bathtub, basic kitchen appliances for breakfasts (small fridge, toaster, microwave), and comfy chairs. Pretty patio outside, though we were not granted many sunny days! It's near some good restaurants, and easy drive to Asheville. Thank you for staying at the Rose room. We hope that you can come stay again and the weather cooperates and you can enjoy the lovely patio. Truly enjoyed our stay in the Rose Room for a romantic weekend. I love older historic homes and this one fit the bill. The location was very accessible to Asheville and Fletcher where we toured the Sierra Nevada brewery. We met the owner and his family and they were very friendly. I would definitely consider staying here again on our next trip to the Asheville area. The character and charm of the Rose Room is hard to beat. We are glad that you enjoyed your stay. We hope that we can host your stay again the next time you are in Asheville. My husband and I had an incredible time staying in the gorgeous Rose Room! Perfect for a romantic getaway or relaxing weekend. The bed was super comfortable, the fireplace a cozy touch, and the giant bathtub was so relaxing! It was less than 15 minutes to all of the attractions we wanted to see (Biltmore, spa, horseback riding, etc) so no extra time had to be spent in the car. The new owners were super nice and very helpful in giving us suggestions on the best places to eat and hike! Will definitely be staying here again! We are so glad that you and your husband enjoyed your stay at the Rose Room. We look forward to having you stay again! It was clean and well thought out. Thank you for staying at the Rose Room. 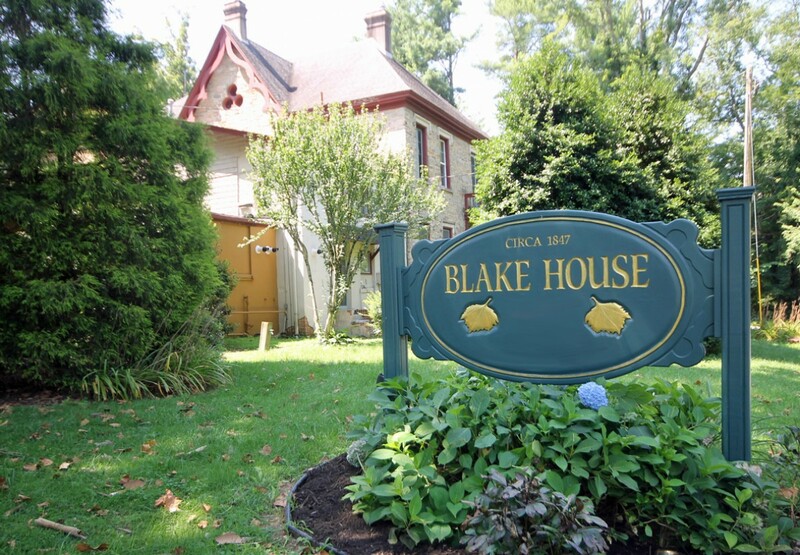 We hope that you can come stay at the Blake House Inn again. You can tell the new owners have put in a lot of TLC. We will definitely be back! We are so happy that you enjoyed your stay. We hope we can host your stay again soon. The cozy but spacious Rose Room of the Historic Blake House Inn was the perfect respite for a weekend in Asheville. The property is exactly as advertised and easily met our needs -- a place to unwind and enjoy a glass of wine in front of the fire and a comfy bed. It's also very convenient to stores and restaurants and a short drive to Asheville. We are so happy that you enjoyed your time at The Rose Room. Thank you for staying and we hope you can come again. My wife and I were looking to explore Asheville for a weekend and stumbled across this place on VRBO. We were a little hesitant at first just because of some old reviews, but we were on a budget and this place fit. When we arrived, we were pleasantly surprised. The room was clean, location was good, and the character of the room was enjoyable. We especially enjoyed the little fireplace. I would say the bed is "OK".... Not the best or worst I've ever slept in, but it was comfortable. I consider that a success in my books for traveling. All in all, we had a wonderful weekend and this room was perfect for our needs! We would happily go again which is about the best review I could post. The Blake House Inn recently came under new ownership and we are so happy that the old reviews didn't deter you from coming. The new owners have put a lot of love and care into restoring the old inn. We hope that you and your wife can come stay again in the future. My wife and I stayed two nights in the Rose Room, and we were very happy with the accommodations. My wife was especially pleased with the historic feel of the property and the very tasteful finishing touches in the room. We found the Rose Room exceptionally clean and t refurbished with great care by the owners. This is no longer a bed and breakfast since new owners took over. While there are no cooking facilities, the room offers a refrigerator and microwave and nice plates with silverware that we took advantage of during our stay. The location is ideal, 15 minutes south of Asheville. The owners live on site and are very pleasant. They have at least one other room for rent on the property, but they told us that we were the inaugural guests in the Rose Room. This is a great choice for a couple looking for lodging with an historic feel. The owners have spent a great deal of time and put their all into the loving restoration of the Inn. We are so glad that you enjoyed your stay at the historic inn and hope you can come again in the future. What a great place! So glad we decided to stay here. Such a cool experience. We debated on staying in the city, but so happy we chose The Blake Inn. Wonderful room, very spacious, and the fireplace and tub was a great treat after coming back from a long day of hiking and walking around Asheville. Very close to the city and everything we needed was close. We ran into the owners and their family a couple of times during the stay and they were great and made sure we had everything we needed. Can't wait to book another trip to stay in the Rose Room! Thank you so much for staying. We look forward to having you stay again!